Father of the groom wedding handkerchief gift. Father of the groom wedding handkerchief gift. A traditional gift for the Father of the groom on the big day. 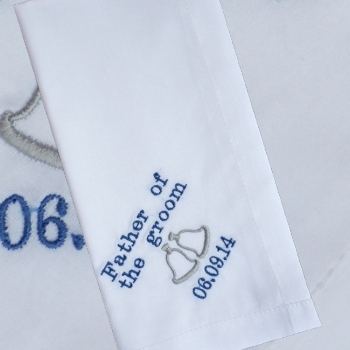 Single white handkerchief embroidered with the title Father of the Groom, a bells motif and your special wedding date. Embroidered on a standard mens classic white cotton handkerchief or you can choose a mens 1/4 inch wide hemstitched large cotton handkerchief.